Greetings from the aforementioned Melissa! I definitely had a blast visiting my two favorite bloggers last weekend in their new hometown of Atlanta. We miss them dreadfully back in the ‘Burg (Williamsburg, VA), but it was wonderful to see them all settled in the ATL. They live in a fabulous neighborhood in a great little house. 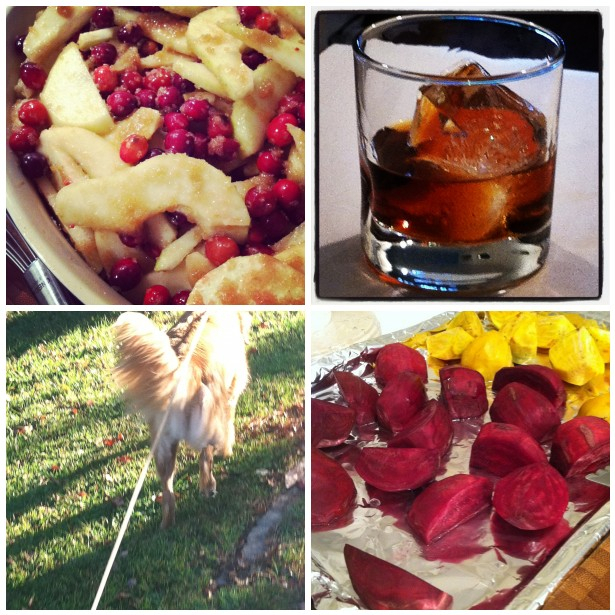 What a wonderful weekend of dog walking, beverage sipping, cooking, eating and hanging out! One thing I love about MK and Gardner’s home is all of the foodie magazines. Food & Wine? Yes, please. Bon Appetit? I think I will. We spent a good bit of a leisurely Sunday looking through the gourmet filled pages and dreaming up a delicious four course meal that we would collectively cook and devour. 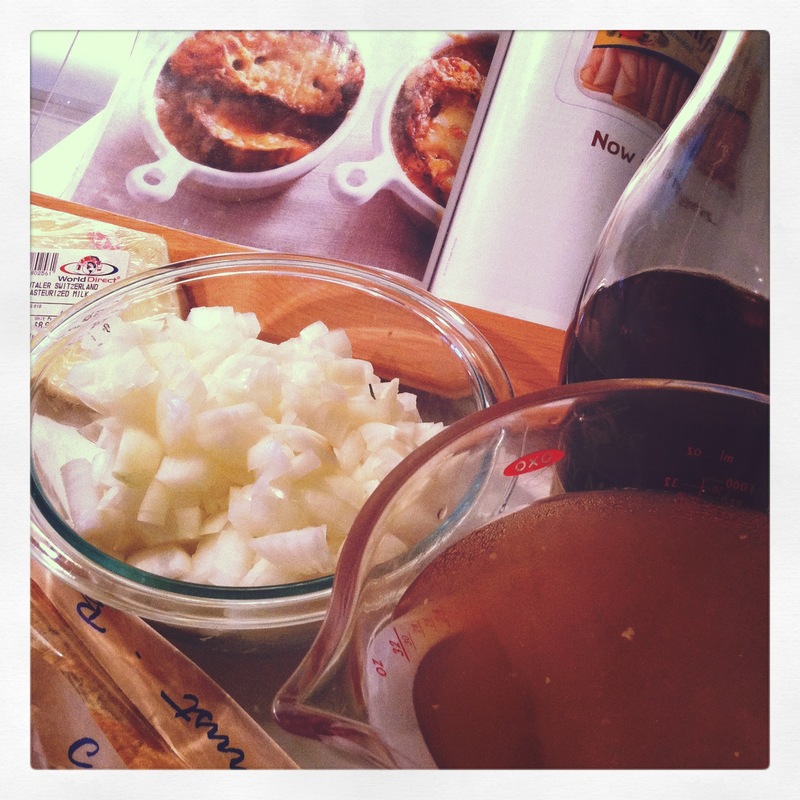 One particular recipe that caught my eye was the French Onion Soup in the October 2011 issue of Bon Appetit. French Onion Soup is something that Matt and I like to enjoy when we eat out (awesome versions at Blue Talon and Le Yaca), but I had never cooked it myself. And why not? Fairly simple recipe with easily findable ingredients. Especially when the 2frugalfoodies just *happen* to have homemade beef stock in the freezer. So we set to it. The results were delicious- homey, comforting, delectable. I plan on making it again and again. During a trip to the most amazing grocery I had ever seen (Dekalb Farmer’s Market), we got some beautiful onions, emmentaler, and some adorable perfect ramekins. Ooh- also essential to our soup- a fresh baguette from a bakery (Alon’s) up the street from their house. Gardner chopped the onions, and then I caramelized them in butter (slowly, at a medium temperature instead of on high heat as the recipe suggests, because Tony would have not approved of the short cut version). After adding the brandy and stirring for a minute, I added the beef stock and let it reduce for a few more minutes. Then we seasoned with salt and pepper to taste. Next, we poured the soup into the ramekins that were placed in a baking dish as to avoid a mess in the oven. We covered the soup with the slices of baguette, and then topped it with lots of cheese. They went under the broiler, until they were bubbly with cheesy goodness. And voila! 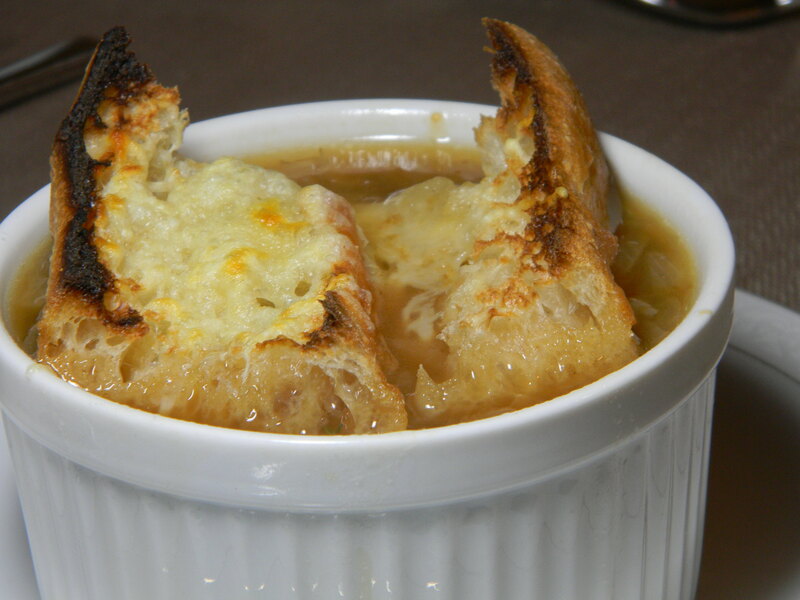 Our very own homemade French Onion Soup. Thanks to Mary Katherine and Gardner for letting me guest blog! Can’t wait until we’re all together again. Best. Hosts. Ever.